Supernode pools are brewing and community members eagerly anticipate a community Supernode script. There’s a brand new suggestion that’s creating a lot of buzz, and in this issue we’ve finally decided to formally introduce ourselves to our readers. There’s a lot of fantastic content in this Update, including an exclusive in-depth look at Elastos’ partner, Titan, a translated interview with Kevin Zhang and Anypeer, updates from the Philippines community, and an interview with a community member from Down Under. First and foremost, we are continuing our coverage of Supernode Candidates. We have a whopping 8 new Supernode Candidates in this piece. Several Elastos Ecosystem partners have come forward to share their Supernode candidacy. We know the community will enjoy some of their unique (and frankly, entertaining) Supernode structures. There was overwhelming exuberance and he has obliged to create it. Peter Strauss and Elastos’ very own, KP, have been diligently working on this script. Please follow Peter and KP’s progress on their Github page. As you have seen this past month, the top two suggestions have successfully been funded on the Cyber Republic. Elastos Orchard is the third most liked, and it looks to be one of the next projects to turn into a proposal which could lead to future funding. There’s another suggestion that has been creating some excitement. It was posted on March 21st and in 24 hours it has shot up to fifth place. The name of the suggestion is called the, “How to read Blockchain Code” Video Series. The objective is to properly educate community members through a video series in order to help them become more knowledgeable investors. The suggestion states that crypto education is great PR for Elastos and CR as well, and these videos could be a part of a potential marketing campaign to bring in more community members. The video series, however, will be hosted on Udemy which is a for-profit video education platform. The suggestion states that the videos will not be for free, but it makes no mention of where the profits will go. What is mentioned is that the money invested by the CR will go to paying for 100 CR members to gain access to the videos. In other words, the CR would pre-pay for 100 members to sign up to this particular video creator’s lessons who may or may not be given by someone qualified and experienced enough to create these videos. Though they state testimonials could come from the 100 CR members to fuel a marketing campaign that could spread to the rest of the cryptocurrency community, who benefits from the testimonials–the content creator? Finally, the CR News and Social Media team really enjoys the work done to keep the community informed about everything Elastos and CR. We put in an accumulated 80 hours or more every week toward each Weekly Update and we’ve received around 1,000 reads per recent issue. By “putting a face to the name”, we hope the community with bond with our team a bit better. All our hard work and dedication is done for the community and we hope that you enjoy learning about us. Kenneth K. is a near full-time world traveler with a diverse background–a professional in many fields such as writing, medicine, photography, dance and athletics. He became involved with blockchain in 2016. He founded the CR News and Social Media team along with KP, and he has been blessed with a committed team that matches his own ambitious vision. He hopes to lead this fast-growing team into becoming the most professional source of news and information on the new internet, believing that by giving the Cyber Republic a strong voice, the team can drastically increase the power and reach of the Elastos ecosystem. Article by article, video by video, building a knowledgeable and passionate community is key to the Cyber Republic’s success. Kiran Pachhai (KP), was born in Nepal and moved to the United States at the age of 14. He graduated with a Bachelor’s degree in Computer Science from the University of Colorado at Boulder in 2014. He has worked in industries from telecommunications to cyber security and now, blockchain. Kiran is the bridge between the CR News and Social Media team and the Elastos Foundation and Cyber Republic Committee. He is most involved with the CR News team as a technical advisor and project manager who reports directly to the Secretariat of the Cyber Republic. He strongly believes in the potential of CR News and Social Media team because, just over the last couple of months, the team has expanded quickly from the CR Weekly Update Team to the CR News and Social Media team and has helped the vision of Elastos and Cyber Republic spread further than ever before. He believes the team could very well be one of the most important community-led organizations as it could grow even further, not only focusing on the Elastos project, but also the entire ecosystem with thousands of potential dapps and projects built on Elastos. By increasing community awareness and support, it will help the CR grow organically. Alex Shipp has been active in the crypto-space as an investor, writer, and strategist since 2017. Presently, Alex is a contributor to both Cyber Republic and the Elastos Foundation as a writer and editor and provides revision services for the CR News team. As a strong believer in decentralized system architecture and individual asset ownership, Alex is convinced that development of the Elastos ecosystem and the propagation of its community stand at the forefront of preserving individual liberties in the digital age. Jeremy G. was born and raised in Connecticut, U.S.A. He went to school at the University of Massachusetts. His hobbies are playing basketball, writing, and being with friends and family. He is a senior writer for the CR News team with a focus on projects building on Elastos. He’s excited to help the team become the one-stop shop for all Cyber Republic related topics and news. He’s humbled to be part of such a motivated and professional staff that is tasked with leading the CR’s brand and image into the new frontier. YY’s interest in technology brought him to blockchain and cryptocurrencies. He discovered Elastos during a local meetup hosted by Clarence Liu and Kevin Zhang, and he joined the CR News team to contribute writing and translation skills to the growing ecosystem. He is amazed to see how team members from different backgrounds and countries can work together remotely, seamlessly, and effectively, producing quality weekly reports for the past 18 weeks. He hopes the team will grow stronger in terms of numbers and diversified skill sets in order to take on more roles for the best interests of CR and Elastos ecosystem. Joel is on the CR News team and is tasked with finding and editing news from the Chinese community as well as translating materials between English and Chinese. He is passionate about Elastos’ vision, and would like to see it change the very values of human society (yes, the scope is that grand). The CR Weekly Update is the quickest portal to seeing the CR’s activity, and he is very happy to work with his teammates, always amazed by their talents in delivering high-quality piece after piece. He reminds the community that Elastos and the CR cannot succeed without the participation of its community members, and he encourages everyone go to the CR Forum to contribute to the latest discussions with their opinions, talents, and skills. Joel can be found on the CR Forum as “iloveonsen” (so keep calm and take a bath). Amos Thomas was born and raised in Trinidad & Tobago. He migrated to the US at a young age. He obtained degrees from Springfield Technical Community College and Western New England University in IT, and with a constant drive to learn about new technologies (especially those so relevant to every industry) he became involved in cryptocurrency August, 2017. Amos is on the CR Social Media team, utilizing his platforms and skills to increase awareness, refine social media workflow, and he is currently building a website for the CR News team. He sees the CR News and Social Media team evolving into a true collective voice of CR Citizens along with the already massive task of keeping the community informed of CR activity. As CR News and Social media is frequently the first impression for the curious, professionalism and clear branding of the CR News and Social Media team is paramount. Mikedave became involved in cryptocurrency late 2017. He’s been an active community member of Elastos since the beginning and was honored to be invited to the Anniversary event in Chiang Mai during the unveiling of the Cyber Republic. He has served the Cyber Republic as the CR Admin, and is now part of the CR Social Media team as the Lead Social Media Manager. He believes the team will grow quickly as he sees the team evolving into a full-time news website and voice for the CR community, CR partners, and Elastos Ecosystem, effectively encouraging community activity and contributions. Faby was born in a small town in Germany. She is a passionate and energetic individual, who cares deeply and loves to share. She identifies as a German fish who has to frequently jump into the ocean, preferably with a surfboard, whenever a beach is in sight. She’s been part of the CR since its inception last August, and she is extremely proud of the dedicated community that will be celebrating its 1st anniversary soon! She truly believes in Elastos’ potential to make the digital world a better and safer place. With her extensive background, working in B2C marketing, sales, and product management in the Tourism industry, she holds a Masters of Business Science and Language and Culture from Denmark, and a Bachelors of Marketing Communications from Germany. She is applying her skills and experience to the CR Social Media Team by focusing on spreading the word about the CR and Elastos’ technology in a less-technical, widely-understood way. Martin is a multidisciplinary designer with experience in retail clothing management and freelance graphical communications. He lives in the English countryside, working on anything creative and riding mountain bikes in his downtime. His main focus is working on design assets for Elastos, so his involvement with the CR News & Social Media team is primarily in graphics and branding consultation. The Cyber Republic’s vision is an interesting one as it’s community-based with no centralised management. It’s bold for an organisation to run fully community-driven, but Martin hopes it succeeds and believes the CR News & Social Media team is very important in making it happen. The team is the communication pathway to businesses, users, developers, and everyone else that hasn’t heard of a new, safer, smarter internet. Many are infatuated with the technology Elastos has to offer. The community is excited about the future of the Cyber Republic and its aspirations of becoming an autonomous, borderless society, run democratically by its citizens. There is more to be excited about, however. The dApps being built on top of Elastos will form the foundation of the Cyber Republic. One of these major pillars in the ecosystem is called, “Titan”. “The project offers a decentralized storage and transport network designed to support a wide range of decentralized ecosystems.” The CR News team was fortunate enough to speak with the Titan CEO. He shared the benefits of Titan product and services, its vision for the future and its challenges, the team and how Titan will interact with the Cyber Republic and Elastos. There are some challenges in improving the performance of CDN and making sure the user experience stays the same, if not better, in the process. Titan’s CEO further explains, “The biggest challenge for Titan is how to balance the user experience and cost and between efficiency and decentralization. As a traditional technology, P2P has been tagged with low cost but low quality. Titan has a lot of innovation that includes encoding/decoding, distributed storage, and multiple streaming protocols. With all these innovations, Titan can provide its customers with same performance as CDN, and with much better fluency.” Titan’s technology clearly sets them apart from the other P2P services around the globe and provides them with a significant competitive advantage, while maintaining decentralization and boasting discounted rates compared to others in the CDN field. We are almost on the verge of a 5G network era where there will be even more bandwidth costs to transfer files and store data. The Titan CEO is well aware of this transformation and realizes that normal CDN will not be able to keep up. He explains further, “On the cloud side, data volume is increasing dramatically and on terminal side, access bandwidth will increase 10~100 times in 5G era. I don’t think traditional CDN is the best option on both a technical and economical front. Titan aims to provide a much better solution by using P2P technology to leverage edge devices everywhere.” The edge devices he speaks of are any devices that provide an entry point into a service provider’s core network, such as a router. Titan will provide the Cyber Republic top notch decentralized file distribution for the future! What’s Titan doing right now, and how and when will it incorporate its technology into the Elastos infrastructure? Titan already has a healthy amount of clients with more on the way. The CEO explains its current operations along with future prospects, “Titan has released a commercial version, and several serious customers have deployed our technology. We also have one potential customer that is testing our technology to support more than 0.6 billion end-users.” Yes, you heard that correctly, a potential 600 million users could be supported using the Titan technology. And what about Elastos integration? The commercial version of Titan does not have the Elastos technology integrated, however in the next version of Titan, Elastos infrastructure will be implemented. This latest version is set to come out in one month’s time. Titan does have current integration with the Shiju TV Elastos box, a big hit in China with over one million boxes sold. Titan’s CEO excitedly explains more about the relationship between them and Elastos, “We plan to work closely with Elastos after next version of Titan is released. I believe Elastos technology (like DID and Carrier) and community are a good plus for Titan. Elastos can integrate Titan project and provide an enriched service to Elastos community and customers.” The Titan Network serves both the blockchain and traditional communities. How about the team? Titan has an experienced core team that comes from some of the biggest companies in the world such as Alibaba, Huawei, and Intel. The CEO invested in Titan as an angel investor. He became such a big believer in the technology and the team that he joined Titan as CEO full-time. He shares his education and work experience, “I graduated from Tsinghua University in 2000. I’d worked in a big Smart card company as a core developer of Card Operating System. During that time, I immigrated and implemented several encryption algorithms. I founded a software service company to provide onsite and offshore services for big companies. It was then that I went to Tsinghua University to earn my MBA. After graduation, I founded another company to provide sourcing and procurement consulting service, which was acquired after 4 years, and I worked as COO for a big state owned internet company for 2 years. From 2018, I started to invest in blockchain and I migrated to the Titan team”. In the past 18 years, the Titan CEO has accomplished so many things, and he is eager to do more for Titan–and in turn, the Elastos and Cyber Republic community. Ultimately, big companies like Amazon, Facebook, and Netflix rely on CDN’s to serve its web traffic. Titan has game-changing technology that has and will revolutionize file distribution and storage as we know it. With Elastos and Cyber Republic being partners of Titan, it will boost the ecosystem by epic proportions. The community of the CR will reap the benefits of being able to send content peer-to-peer in a quick, easy, and affordable fashion, with all the security of Elastos blockchain technology. All the building blocks are being formed in order to create an infrastructure for the new Smart Web. Titan is just one of the crucial ecosystem partners of Elastos that will bring the CR into the next frontier of the new internet. “Elastos community should not be unfamiliar with ELAfish, or FishChain, as it is one of the very first blockchain games that enables ELA mining. “Eye worm”: Product partner, graduated from Peking University Life Science Academy, the proposer of the “Pipeline Model” of the General Economics, the major planner of “Bubble Fish”, senior game system and numerical planning. “Bear Crow”: Art Partner, graduated from Lu Xun Academy of Fine Arts and French MJM Art and Design Institute, the artistic director of “Bubble Fish”, good at grasping the aesthetic sense of game products. Jacky Cheung: Executive Director, “Bubble Fish” Business and Public Relations Officer, years of experience in gaming product operations. Light: Director of Operations, responsible for the operation of “Bubble Fish”, and many years of experience in media operations. Hong16: Art Director, graduated from the Academy of Fine Arts of Tsinghua University, the creator of “Bubble Fish”. Recently the Elastos ecosystem partner, ioeX, has announced they will be running a Supernode as a part of the Elastos DPoS Consensus. 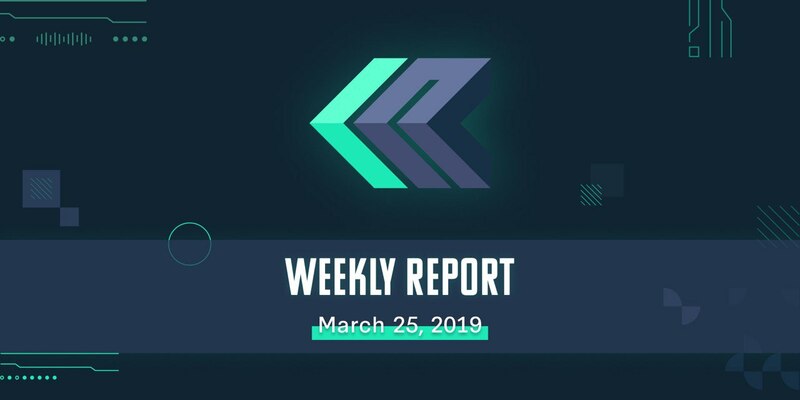 In the next week the CR Weekly Newsletter will provide more details about the specifics of the Supernode ioeX will provide. One of the CR Chinese community member “Hero J” has created a topic with the aim to raise his concerns about Elastos technical development and its inflationary economic models. He agrees with the idea proposed by Sunny Feng Han that Elastos wallet should be used as an ecological entrance for development rather than several dApps created by different teams with different objectives, which may lead to confusion among community members. In this respect, he proposes that the Elephant wallet should be further enhanced and integrated with other important functions such as messaging, voting, and even the forum to consolidate Elastos’ technical capabilities. Nice to see Chico’s positive presence in the community! As there are many terms to such a large project like Elastos and the Cyber Republic, we’ve decided to build a growing glossary of terms that can help the less technically acquainted understand better what the tech means and the impact it could have. This week we’re focusing on DPoS. Elastos is not a strict DPoS; it is a hybrid model that is not only merged-mined with Bitcoin, but its DPoS consensus mechanism enforces community proposals that may include changes (even like different consensus mechanisms) such as new sidechains or architectural changes to the main code. PoW miners who fail to update won’t have their blocks signed by the Delegates, which means that they won’t create forks since their blocks are considered invalid. All public blockchains need a way of determining consensus (machine agreement that certain data–like a funds transfer–is in-fact, real). Delegated Proof of Stake is a method of finding consensus in which specific machines (delegates) are trusted; therefore, what they verify a true is also trusted. These machines are voted on by the community, and if they do anything malicious or fail to do their job well, they can be voted out by the community as well, thus losing their trusted status as well as some (or all) of their staked 5000 ELA. DPoS is much more energy-efficient and faster than PoW. Since Elastos is a hybrid consensus model using DPoS and merged-mining and community consensus, it takes the strengths of each and bundles them together into a blockchain that can’t be forked, is highly efficient, and is very safe. AnyPeer was recently made open source and has seen significant progress. They frequently provide updates on the CR Forum. We have interviewed their representative this week to learn more. 1. Can you briefly introduce your team? What are their specialties and roles? We have four members in our team: one for graphics design, one programmer, one responsible for project management, and I myself works on both coding and project management. As we are all working part-time on AnyPeer, we usually brainstorm and discuss progress evenings after work. 2. We’ve seen several progress updates in the CR Forum. Can you explain them in more detail? We made the basic version of the code public in Feb 2019 (https://github.com/anyxxx/AnyPeer), and we welcome anyone to test it out and fork it. In this version, one can send texts, emojis, pictures, videos, and ELA (via testnet). We spend our downtime integrating group chat functions into the App, and we are now testing and optimizing the user experience. In the last version, for the sake of UX optimization, we’ve included some extra data (to confirm receipt of messages) after sending messages, which has led to improper communications with other apps based on the same Elastos Carrier. We plan to release an optimized version that solves this issue in the coming week. In short, the updates include group chat and compatibility with other chat apps. 3. Besides chat apps, do you have any other projects in development? Besides the basic chat functions, we are considering integrating the Red Packet function into AnyPeer. We also want to make some built-in games, depending on the technical difficulties. 4. As developers, do you encounter any difficulties when building dapps? What future Elastos updates would you like to see that would help with the development process? Regarding the Carrier and SPV functions, there haven’t been many obstacles as the codes in the libraries for testing or demo can showcase the basic functions, and we found them as good references. We are eager to see the release of offline messaging functions (Elastos Hive) that better the user experience. 5. How do see the coming DPoS election? Will your team compete for a node? Hmm… We will mostly likely vote only. 6. Is there anything you want to say to the community? Every member of Elastos should contribute so that we can make better and faster progress. We invite the community to try AnyPeer when the next version is released and give comments and suggestions so that we can make improvements. On March 1st, Kevin Zhang was the guest on “Elastos Talk” to present his thoughts on CR. The sharing of this week is performed in questions and answers. Here is the transcript of what Kevin shared. 1. Would you please briefly introduce the future business model of Elastos? As a public chain, Elastos is much like a database or an infrastructure. Its business model depends mostly on the DApps running on it. As a public chain, we can run a variety of games, business applications, communication tools, etc. Once Elastos becomes a platform that supports DApps, ELA will be used to pay the service provider, and then ELA will have a circulation value. 2. What is the daily work of the CR preparatory committee? What progress has been made? I am honored to be a member of the CR preparatory Committee. Since last August, we have been preparing for the CR election which is going to happen in August this year, including the establishment of the entire CR charter and the current daily work. Our daily work includes the weekly meetings among the three committee members and the general secretary Rebecca. In the weekly meetings, we select the highest-rated suggestions that we think are valuable from the CR website. Then we will have an in-depth discussion and vote on this suggestion. If the suggestion gets two or more votes, it is approved. After a transition period of 72 hours, the proposal will be implemented. Let’s take an example of a proposal that we have passed. I proposed a project named React Native Funding. It is actually a technology platform for community developers and it was suggested by the community last year. There are many application developers using this platform and they might also develop applications for Elastos. Now they need funds to continue development of this platform. Because Elastos will not provide any funds for the community in the future, the suggestion regarding this project was submitted to the CR. This suggestion ranks the highest amongst all suggestions in the community, so I made the proposal. I explained to the other two members why we need this project. I convinced them and they signed it. Then the suggestion became a formal proposal. If there is no objection, this project will become officially established. For the next step, the team leader must propose a budget. If the budget is approved, they will build a team to develop it. 3. How will CR promote community and ecological development after CR officially goes alive? What I mentioned above is an example how CR promotes community and ecological development. The decentralized organization, the CR, will have all the power. This is very different from traditional companies or organizations where the power is controlled by the top-level people. Members of the CR Council will be democratically elected with DPoS Consensus in August this year. The elected members perform their duties as stated and will listen to the opinions of the community regarding what the community agrees on or opposes. The power of the CR is given to Council members elected by the community, but they can also be impeached. If a member does not do his/her duty, then they can be impeached (through a mobile app). Then, other members who represent the best interests of community will be elected. This is the basics of how the CR works. Simply speaking, CR Council is like the US congress. Its mission is to determine a direction that represents the community’s interests and that the community agrees on. CR Council must make several decisions, such as whether to participate in various ecological constructions, whether to support a project, whether to cooperate or stop cooperation on a project, and so on. After the EF (Elastos Foundation) tokens are used up for development, the EF will gloriously withdraw from the stage and community development is carried out by the CR council which will be the highest, and only, authority in the future. 4. What strength does Elastos have over other blockchain projects? The technology of Elastos main chain is a relatively mature technology that combines PoW and DPoS to provide a platform more easily adopted for most developers. But I want to say more than just the main chain, because Elastos is not just a blockchain project. In fact, Elastos can be considered a platform for the Smart Web and the public chain should be regarded as a database that cannot be tampered with. The traditional Internet has some components, such as communication protocols, security, and execution nodes. Comparatively, Elastos is a relatively-complete Smart Web infrastructure including a public blockchain, peer-to-peer communication network Carrier, Runtime, and a variety of operating environments, development kits, and Elastos Hive, DMA, etc. All these components form the ecosystem, together. It is not appropriate to create the dapps directly on the blockchain. Elastos makes the most of decentralized trust which is the strength of the blockchain, but massive amounts of calculations cannot be performed effectively on the blockchain itself. Instead of trying to make all kinds of applications run on-chain, Elastos is committed to building a safe, trustworthy, and decentralized computing environment. On the first layer, we provide a decentralized trust that is fundamentally credible and unchangeable. So how then do we run the calculations? Our infrastructure has a second layer [sidechains] including P2P networks and computing nodes. The various apps on the second layer are actually responsible for calculations. The dapps can be run perfectly by combining the computing power from the second layer with the trust and decentralization of the first layer. Therefore, I firmly believe that a large number of apps should not be run on the main chain. This is not realistic and will not meet expectations. 5. Are proposals voted by the CR Council or community members? We adopted a DPoS consensus model, but proposals are voted on by council members who are elected by the community. All information is managed with code to avoid human tampering or dictatorship. Information such as voting and impeachment for Council members are coded and written onto the blockchain. If a person is elected, his private key gains access to CR funds. If he/she does not perform his/her duties and obligations, the community can impeach him/her. As long as the number of impeachment votes exceeds a set standard, then the Council Member’s signature will automatically lose the right to spend CR funds. 6. What special projects does Elastos have compared to other blockchain projects? Actually, projects will be built on our ecosystem partners [sidechains]. Elastos will not have a lot of applications directly on its infrastructure. We are building the infrastructure such as DID chain, identity verification, DMA decentralized market, basic services, communication networks, etc. We will support developers to build various commercial apps on our infrastructure. As a public blockchain, we need to make these infrastructures very user-friendly. Software developers can have several choices such as Ethereum, NEO, or Elastos. If our infrastructure is convenient for developers, then we will attract more developers to use Elastos infrastructure. Please keep your eye on the CR website. People post new suggestions on CR every day. Read the comments of the members on these suggestions. In this way you can understand whether opinions are consistent with your own thoughts. Every token holder is an important member of the community, and your voice can affect the development of the entire community. If your voice is adopted by the CR Council, it will affect the development of Elastos which I believe relies on the joint efforts of everyone. 7. What are the CR and Elastos Foundation responsible for, respectively? The CR and Foundation are two completely separate entities. The foundation’s mission is to make the Elastos product, and CR’s work is to organize the community. We have so many members in our community and we must have a democratic mechanism to determine the direction of where Elastos is going. Many important decisions are from the CR. The CR’s decision is from the CR Council members who are elected by the members of the CR. LVCC is a private non-stock, non-sectarian educational institute in Apalit, Pampanga, the southernmost town in the province adjacent to the booming Bulacan province, and nearest Pampanga town to Metro Manila. It is among the largest campuses in the area and is affiliated with a Christian group that operates broadcast stations known for excellence in broadcast communications. Attending the event were Senior High School students under the STEM track (Science, Technology, Engineering, Mathematics) and College students taking ICT subjects. Featured were tech industry speakers, a student hackathon, computing workshops, and quiz bees on ICT subjects. Mr. Alex Timbol was invited to speak by Mr. Romack Natividad, LVCC ICT department head due to his postings in the Pamapanga Startup FB group. To accomodate Elastos alongside the designated blockchain technology speaker, Mr. Timbol prepared a talk on Techpreneurships, startups, and SMEs. His talk was sponsored by Elastos and Raemily’s Food Service of the Amadas, based in Pampanga. This ensured that Elastos’ logo was placed on slides and banners at the venue throughout the event. Mr. Theo Salvado on Web Vulnerabilities and Hidden WordPress Features. Mr. Jospeh Perdon on BizTalk. Mr. Kennedy Rodriguez on Computer Networking. Mr.Jeffret Cabrer on Android Development Backend Architecture. Mr. Rolando Cruz on different views about Web Security. Mr. Alex Timbol on Techpreneursip, with lessons on SMEs and Startups. Mr. Julius Fresco of NEM Philippines on blockchain. Mr. Nelson Ibunma on social applications of blockchain, and the GST token project. I had lunch with NEM and the school’s ICT instructors to discuss future partnerships with LVCC and the possibility of participating in future events, including seminars and talks. LVCC is strategic for the Southern Pampanga and Northern Bulacan area because of its large conference facilities and complementary leadership position in Communications, SMEs, and Agri-technology vis-a-vis the outward facing (export oriented) Metro Clark ICT council which encompasses Clark Freeport and Angeles City. Would you mind telling the community a bit about yourself? I’m originally from Tokyo, Japan. I came to Australia with my family at a young age and have been living in Brisbane ever since. I did most of my studies in Brisbane. I’m currently working for the Residential Tenancies Authority which is a state government body. I’m also working on a business outside those hours to promote technology that can create value for businesses and government and, ultimately, consumers. All the technologies we are working with are produced by Japanese companies. So, basically, I do the groundwork for overseas tech companies via marketing, business dev, and pilot programs. With your business connections in these industries, do you plan on pushing Elastos technology for adoption in their current business infrastructures? Do you have any insight on connecting businesses with Elastos and the Cyber Republic? Yes, I definitely plan on doing this. I have an ongoing relationship with companies specifically in electronics. I’m also working with an REIT company as I want to make way into that industry as well. I’ve seen projects that use blockchain solutions for real estate investments, so perhaps that could be interesting. I’m yet to make any moves, however. I hope to get a bit of guidance on this and I’m watching to see how things progress from Alpha to Beta. How did you first learn about blockchain, and how did you run across Elastos and the Cyber Republic? What role do you play in the Cyber Republic right now, and what roles do you hope to fill? I first learned about blockchain mid to late 2016 when I was doing some research for my business. I started off with the notion that blockchain is good and cryptos are bad. I believe the first time I heard about it was in Deloitte paper that covered briefs on technologies with a lot of potential. One of the technologies we are promoting is an indoor farming tech and I saw blockchain’s application in the supply chain. Less than a year later, a friend of mine was trading cryptos and I started to look into it deeper. I first came across Elastos via Youtube. I was a fan of NEO when I first got into cryptocurrencies and this interest in NEO led me to Youtubers such as Chico Crypto and Blockchain Brad. They both covered Elastos which drove me to look into the project further. This led me to the Cyber Republic and Elastos was the first project I really got excited about. I wanted to join. I was part of the Marketing CRcle and I organized monthly Meetups in my city and participated in other Meetups to promote Elastos. I have stopped the monthly Meetups now due to the restructuring, but I plan to resume them ASAP now that Suggestions are open. I also participate in blockchain and crypto conventions in my local region. I’m in the midst of writing my first article on Elastos which I hope I can finish by early April. I plan to continue doing tasks for the CR. My aim though is to get more involved in the Business Development side as that is what I enjoy the most, and I think I’ve picked up some skills and experience that I can use for the project. Can you speak of your contributions for Elastos and the CR in the past? I have done a couple of meetups in Brisbane starting from November, 2018. I did a presentation at the Sunshine Coast again for a local Hackathon community in January, 2019. I met the organiser at the Crypto Coast convention, and I will be attending their next hackathon which is next month. Apart from that, I have been reaching out to participants at BTC meetups in my area as I see this as a good bridge for our community. I’m also part of crypto Facebook groups along with AusTrader (Aaron) to put in a few msgs here and there on Elastos. I have been catching up with two devs who have shown interest in Elastos. One is working on a harvesting technology for vineyards, and he is looking at Elastos’ possibilities though nothing concrete has been promised. The other put his hand up late last year but due to the recent state of the CR, it was turned down until things are clearer. What future meetups do you have planned? And how do you plan on engaging the Australian community even more? I plan to do a Meetup in May even if I don’t get reimbursed, but that may be the only Meetup I organise out of pocket until I can get funding. I plan to attend more Meetups by other groups – mainly hackathons and BTC and ETH community Meetups. I will be attending a BTC meetup next Thursday to make more connections. I’m also part of some Australian business networks. One network spans across the following states and one country: Queensland, New South Wales, Victoria and South Australia with New Zealand being a recent addition. I am an alumni of one of their series. I plan to spread Elastos via this network. I may write an article on Elastos quarterly, depending on how things go. What do you like to do for fun? Any hobbies or activities that you like to engage in with friends and family? I like to play soccer and futsal. I enjoy going to the beach and I try to go camping whenever possible at a place called Stradbroke Island (2nd largest sand island in the world – Queenslanders are lucky in that we have the world’s 3 largest sand islands off our coast). Learning about economics has become a hobby of mine recently, and I also enjoy chilling with friends and listening to music. I used to play the drums frequently. I occasionally still play but music is something I’m very passionate about.